If you’re an online retailer who doesn’t track sales and revenue, then you’re missing out on a wealth of data. Not just any data, but data that can help you make informed marketing decisions about where to spend display ad dollars, which keywords generate the most revenue, and which websites or search engines send you the most revenue, not just traffic (although these may be the same). Tracking sales from your website should be one of your first priorities when you set up a shopping cart. Google Analytics e-commerce tracking works with almost all CMS systems, including Magento, Shopify, and even WordPress. Setup is a breeze, and monitoring and reporting are straightforward. Some of the metrics you’ll be able to gather from the tracking software include purchase quantity, items ordered, product category, and sale-referring sources. To which metrics within Google Analytics and e-commerce tracking should you pay the most attention? A conversion rate is calculated by dividing total conversions by total clicks and multiplying the quotient by 100. Using conversion data, we are able to see which landing pages perform best in terms of revenue, which sites send the most relevant and highest-converting traffic, and which keywords provide the most revenue. These are great data points for any online retailer, as they allow you to optimize your marketing tactics and get the biggest bang for your buck. 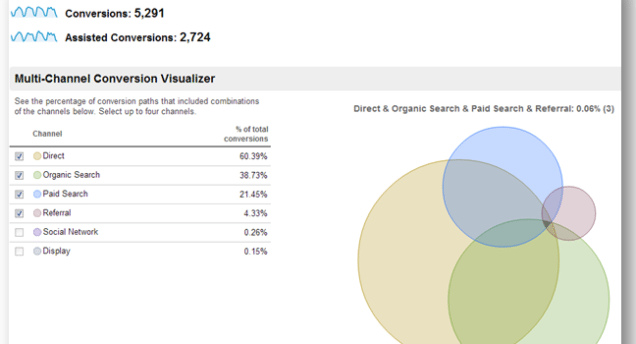 Another great measurement Google Analytics offers is bounce rate. A bounce happens when a user visits only one page on your site prior to leaving it. The bounce rate for an online retailer is normally closely tied to conversions because it can tell you if users have found what they were looking for or visited the site in search of a product you don’t provide. For example, selling only children’s books when your website’s keywords relate to books in general could increase your bounce rate. Users who visit your site looking for adult novels will not find what they are looking for and will leave your site immediately. By using Google Analytics’ organic keyword data and bounce rate percent per keyword, you will be able to see that these users don’t make it past the first landing page and that they came to your site looking for a product you do not sell. Your website generates traffic from many online sources. You advertise with banner ads on websites in your vertical, you engage in link building via guest posting, and you run a PCC campaign via AdWords. The traffic sources tab in Google Analytics helps you determine which referrer provides you with the most targeted traffic (i.e., conversions). 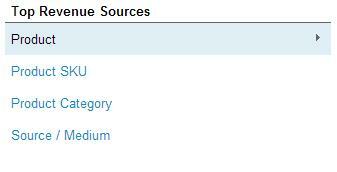 The following image shows which websites provide you with the most revenue, transactions, and so on. When a customer visits your online store and makes a purchase, it’s usually not his or her first time visiting your site. Customers nowadays are savvy shoppers, and many do their homework before committing to a purchase. Most customers will visit your Facebook page, blog, LinkedIn page, or other websites to learn about your business prior to making their purchase. Knowing where these potential customers have been prior to coming to your site is where multichannel funnels come into play. Suppose a customer sees a Facebook ad, comes to your site, and does not purchase anything. The same customer then Googles your brand name, visits a review site, and from there, heads to your site (via a link from the review site) and makes a purchase. By using multichannel funnels, you will be able to see that this customer indeed began engaging with your business because of an ad you placed on Facebook. Over time, these different conduits collectively led the user to your store. Now that you have all this data at your fingertips, you can make highly informed marketing decisions. Use your conversion rate to see which landing page performs best, and build your other landing pages around that one. You should also see which keywords convert most efficiently and whether there are other SEO tactics you can employ to improve these keywords’ ranking, thus increasing conversions. Research and determine which traffic sources drive the most revenue to your business, and invest more marketing dollars into advertising on these sites. If there are sites that are driving sales and you’re not advertising there, reach out to the webmaster to see if there are advertising opportunities available, and push to increase conversion there. 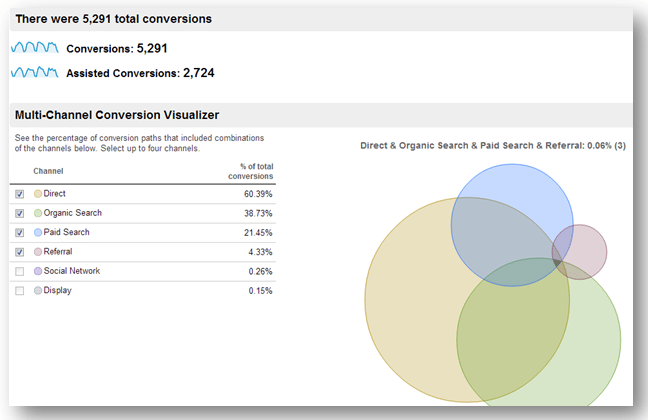 Vizion is well versed in Google Analytics setup, goal configuration, and strategy assessment. If you feel you’re missing out on some hidden jewels in your Google Analytics and marketing strategy, give us a buzz, and we’ll take a look for you.